Sunday was football day. First we had the Patriots playing the Chargers and the marquee game (if you are a New Yorker) of the Giants vs the Packers.I was enjoying the 1st game into the late third quarter when it became pretty clear that the Patriots were going to win again (18 in a row - can't argue with that success rate). I looked out the window and the sky was turning red. I figured I could miss the end of the game and grab some sunset pictures. I asked Kimmy if she wanted to go for a few minutes (it's never really a few) and she actually agreed. We drove a few blocks away up the mountain where we had a great view of the sunset and parts of the reservoir. I took a few practice shots and realized that I had left my gloves at home (pretty stupid when it is 15 degrees out and you are holding a camera). Once I had what I thought was some good framing Kimmy jumped out of the car while I grabbed my flash. 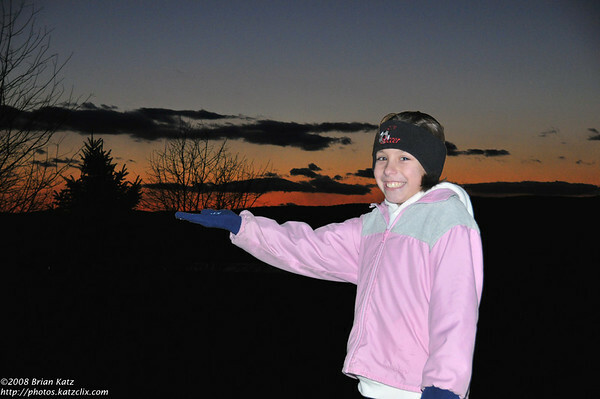 I had intended on getting Kimmy to present the sunset (an idea for a photo contest) holding a hand out right at the mountain level.